More of my reviews at Secrets of Lost WordsYou can also read this review hereOkay, so how do I write this review without sounding like total fan girl? 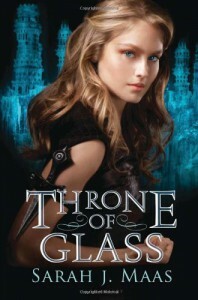 ;)First of all, I LOVED THE THRONE OF GLASS. Celaena is one of the most kickass and funny heroine I've ever met! I loved Celaena :) She is a very bold, headstrong, and very humorous. I find myself cracking up every time she embarrasses Chaol and Dorian. She is the most deadly assassin in the kingdom and I like how she can be girly too :)She knew how she appeared, seated atop a horse like some prize lady being brought to the castle. So Celaena only smiled at them, tossed her hair, and batted her eyelashes at the prince's back.Her arm stung. "What?" she hissed at the Captain of the Guard as he pinched her. "You look ridiculous," he said through his teeth, smiling at the crowd.She mirrored his expression. "They're ridiculous." His Upmost Highness, Prince Dorian, was charming. I believe Celaena found him to be.. Handsome :)Princes are not supposed to be handsome! They're sniveling, stupid, repulsive creatures! This one..this..How unfair of him to be royal and beautiful. I think the story was very well-written. It was a very engaging read. It pulled me in from page one! I loved how Celaena was sarcastic and bold. That girl was NOT afraid to speak her mind! Dorian and Chaol were such gentlemen. Well, maybe not so much with Chaol. I think that Dorian liked Celaena from the start, but Chaol gradually liked her too. Chaol was really harsh with Celaena in the beginning, but then I guess that was expected considering Celaena is a criminal.So Celaena had to compete with assassins and thieves from all over the world to be the King's Champion (which is just a nicer word of being His Royal Highness's assassin, murderer, and killer, take your pick). Celaena was pretty confident. She never showed a weakness. She was all like, "These are the people I have to compete with? Please, I can beat those kids in my sleep." She built friendship with some of her competitors and had allies which wasn't so bad. I loved the story. I found it very exciting. I think it really explains everything about Celaena clearly and it really describes the surroundings well.I was kind of disappointed by the fact that Celaena didn't actually murder anyone. She is the most well-known assassin in the kingdom, yet she didn't actually kill anyone. That kind of disappointed me. Other than that, I FRICKIN LOVED THIS.One last quote because Celaena is just that awesome:"Let the second duel commence," the king boomed, waving a hand toward the veranda.Chaol squeezed her hand, his skin warm in the frigid air. "Give him hell," he said. Grave entered the ring and drew his sword.Pulling her hand from Chaol's, Celaena straightened her spine as she stepped into the ring. She quickly bowed to the king, then to her opponent. She met Grave's stare and smiled has she bent her knees, holding the staff between two hands.You have no idea what you're getting yourself into, little man.What are you doing? GO PICK THIS UP IN STORE RIGHT NOW!!! It's worth it!